This was one that had shown up in several areas in NY state. However, almost all of those reports were before I got into the game, including the 2007-8 from Oak Beach, on Long Island. When this bird was reported in Southold Long Island, I decided this was the bird that I would make my first state and life bird of 2017. Mei Yee and Myles joined me for an early morning twitch and with the help of the Feustels, Menachem Goldstein and his mom who were on site before we arrived, I finally filled the hole on my state list while adding also adding Townsend's Solitaire as a new life bird. When I saw an e-mail rather late in the evening on January 14th from birder Richard Aracil reporting a Ross's Goose from Pelham Bay. I was excited but also not happy. While I was happy to read that Richard had found the last Goose I needed for the borough; I was not happy that I got wind of its presence so late in the day. I decided that I would twitch the Ross's the next day and dragged along two other intrepid Goose seekers, young Myles and Mei Yee with me. They both thought it crazy to get up as early as I demanded (5:30 a.m.) but were game for the chase. Canada Geese with Ross's Goose at Pelham Bay Lagoon, Bronx NY. We got out on time and made it to Pelham Bay before light. Pulling into Orchard Beach, I decided to check the Gulls in the parking lot, which were mostly made up of Ring-billed Gulls. After a careful scan turned up nothing noteworthy, I then decided to check the Pelham Bay Lagoon since I had seen Canada Geese sleeping when we arrived. 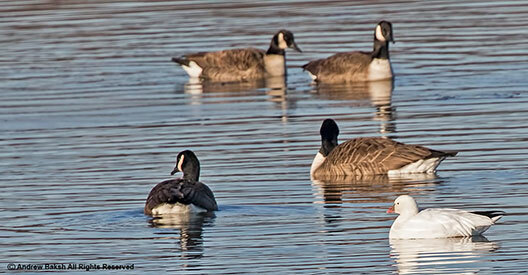 My hunch paid off as I spotted a lone white Goose sleeping among the many Canada Geese. Ross's Goose at Pelham Bay Lagoon, Bronx NY. We waited patiently and after about half an hour, the white Goose untucked its head and bingo a Ross's Goose was ID'd. I was ecstatic!! This was the last "expected" Goose that I needed in the Bronx having already seen, Barnacle, Brandt, Greater White-fronted, Pink-footed, Cackling, Snow and Canada Geese. I was also happy for Maggie and Myles. It was Myles'2nd Ross's while it was the third for Mei Yee. I hope the next Ross's Goose for the Bronx show up at Van Cortlandt Park, which if I got would make a sweep of all the expected Geese in one location. Now that would be worth pursuing. In the meantime, I will enjoy this one very much, thanks to Richard Aracil.